Normally, I lead with the price trends chart, but today, I'm leading with the HSI chart, because Ashland broke the 400 barrier, which we haven't seen before, don't think. That's kinda crazy. 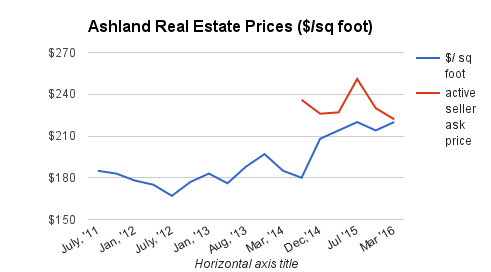 In what is terrible news for home buyers, there are just 10 homes for sale in Ashland. 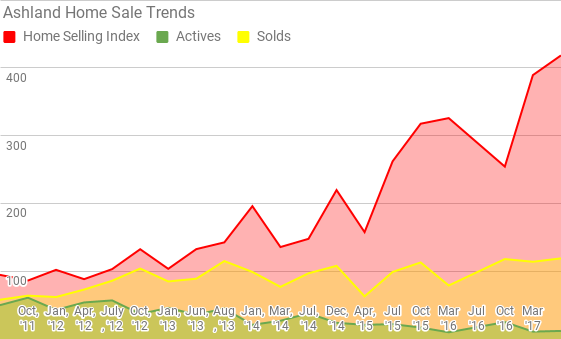 We noted throughout the last month the lack of inventory almost everywhere, but 10 homes is really shockingly low. My latest reports on Ashland are linked below. I've started a specialty blog for Ashland, as it has one of the more diverse property sets ups in Metrowest. Looking for the latest and greatest Ashland real estate info? I'm moving it all to a dedicated site as I try out some Microblogging! You can catch up here!